In Galatians, as in each of his epistles, Paul dictated the majority of the letter to a scribe. It wasn't until the end of the book that he would take the writing instrument and conclude in his own writing.The general form of the conclusion of these epistles included greetings to specific individuals, a final exhortation, a personal signature and a closing prayer. 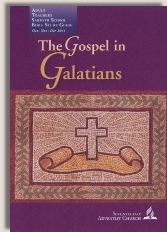 The book of Galatians is different though because Paul chooses instead to teach and expound on what he's been talking about throughout the book of Galatians—because he's greatly concerned that the members of the church of Galatia aren't getting it. One of the interesting things is that Paul does dictate his books to a scribe who writes them down. Imagine if you had been his scribe writing down Romans for the first time. How would that have changed your life? There are many possible reasons that Paul uses a scribe: simplicity, physical deformity, failing eyesight possibly brought on by the opponents of the By Grace Through Faith truth that he was teaching. It could also be as simple as writing in big letters like a child because the Galatians are being childish in their understanding—or to emphasize once again that the legalists of the day are perverting the Gospel of Christ to avoid persecution. The final option seems the most likely, as it logically follows the entirety of the book itself.